Mayo will have left MacHale Park on Saturday night, with a feeling that they aren’t that far away from the All Ireland champions Dublin. Oonagh Whyte’s goals - which came in either half were the decisive scores in this game, that saw Dublin run out two point winners after 60 minutes of entertaining and exciting football. 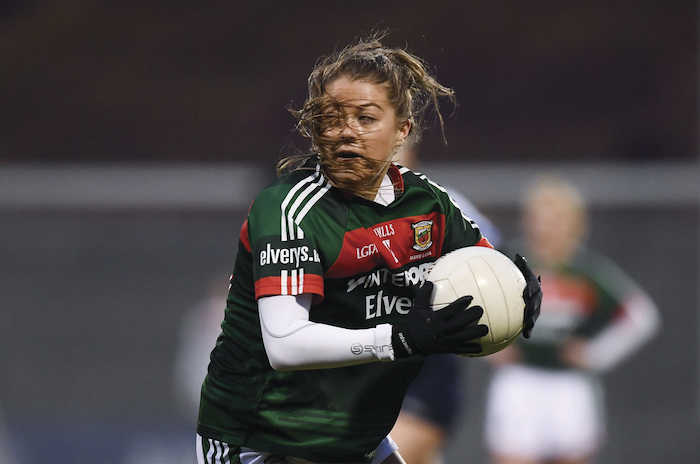 Mayo welcomed back Sarah Rowe for her first game of the year and the Kimoremoy attacker finished up with four points to her name before she was called ashore with 14 minutes left on the stopwatch. Peter Leahy’s side featured nine of the team that started last years All Ireland final loss to the visitors and they went toe to toe with Dublin right until the final whistle. Sinead Aherne opened the scoring for Dublin two minutes in with a close range free, Mayo replied through Rowe’s first point not long after and by the fourth minute Mayo had gone into the lead though a fine score from Sinead Cafferkey, the Kilmovee attacker finished the day with three points for her efforts. Dublin levelled the game up in the sixth minute through a long range effort from Noelle Healy and two minutes later they plundered their first goal. Mayo will be disappointed with how the conceded the goal, with Whyte able to get a flick to a long range free from Aherne that dropped short - edging it past Elaine Murphy in the Mayo goal. The goal didn’t knock back Mayo and they responded really well, kicking the next three points of the game to level the game up by the 15 minute mark. Grace Kelly, Rowe and Cafferkey all registered scores in this run, as Mayo showed Dublin they weren’t going to bow down easily. Dublin edged back in front again thanks to an excellent Healy score from out on the left handsome of the field, from a tricky angle. Mayo went right back at it and hit their second run of three points on the trot, through a brace of Rowe points from frees and another Cafferkeyscore to lead 0-8 to 1-3 as the half-time whistle approached. Dublin closed the gap back to a point before the short whistle thanks an excellent Healy score following some neat build up play and it was all to play for in the second half. It took the All Ireland champions less the a minute to bring themselves back to parity thanks to a Ahern point from a free. The game was nip and tuck for the next few minutes with Aherne and Sarah Mulvihill swapping points as the clock slipped past the 40 minute mark. Healy and Niamh McEvoy tagged on two nice points for the visitors to put them back into the lead by two points. Niamh Kelly cut the gap back to a single score with 12 mates left on the clock, both sides missed a few chances over the next few minutes. The next score was going to be vital and it went the way of the sky blues, when Whyte got in on goal and made no mistake to push her side into a 2-8 to 0-10 lead. Mayo kept working hard and they did mange to close the gap back to two points thanks to two late pointed frees from Grace Kelly, but the weren’t able to create the goal chance they needed to take if they were going to win this one. Mayo: E Murphy; E Ronayne, N Moran, S Ludden; M Corbett, S Tierney, D Hughes; C McManamon, A Gilroy; S Cafferky, F McHale, F Doherty; N Kelly, S Rowe, G Kelly. Subs: S Mulvihill, R Flynn, R Kearns, A Dowling, O Conlon, T O’Connor. Dublin: C Trant; M Byrne, K Murray, K Fitzgibbon; L Caffrey, L Magee, N McEvoy; O Carey, S McGrath; A Kane, L Davey, C Rowe; N Healy, O Whyte, S Aherne. Subs: D Murphy, E Flanagan, R McDonnell, J Dunne, D Lawless, L McGinley, E Rutledge.